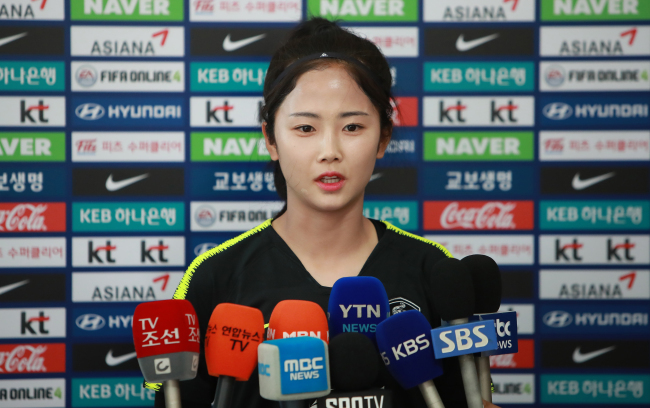 South Korea women's national football team midfielder Lee Min-a said Monday she is eager to win gold at the upcoming Asian Games. Lee, who plays for Japan’s INAC Kobe Leonessa, is one of the 20 players who will compete in the women‘s football competition at the Jakarta-Palembang Asian Games in Indonesia. It will be her first appearance at an Asiad since she started representing the country in 2012. The Taeguk Ladies have yet to win a gold medal in women‘s football at the Asian Games. They took bronze medals in the last two editions of the Asiad. “You always want to win a gold medal at a competition, and we’ll work hard to win it,” she said. Lee, who has 11 goals in 45 caps, is expected to lead South Korea‘s attack with her vision and technique. Lee emphasized that she is not the attacking ace of the team. The women’s football tournament at this year‘s Asian Games features 11 teams. South Korea are in Group A with Indonesia, Taiwan and Maldives. North Korea, the defending champions and winners of three of the past four gold medals, are in Group B with China, Hong Kong and Tajikistan. Group C only has three countries: Japan, Vietnam and Thailand. The top three nations from Groups A and B, and the top two from Group C will advance to the quarterfinals. Lee said she really wants to beat Japan at the Asian Games this time. The two teams played to a scoreless draw at the Asian Football Confederation (AFC) Women’s Asian Cup in April. “We have confidence and we‘re also mentally ready that we can beat them this time,” she said. When asked about hot weather in Indonesia, Lee said it will not be a big problem. “It’s something related with our mental strength,” she said.